It's all about time. The distance you travel at prescribed speeds determines the time it will take to move along each leg or segment of the rally course. The goal is to arrive at each checkpoint with the least amount of error in time, either ahead or behind. The team with the fewest penalty points (seconds or hundredths of a minute early or late at checkpoints) wins. To help you along the way, course instructions set out the speeds, distances, or times between points where changes to one or two of these variables must be made. This app allows you to compute the ideal time to cover a particular distance at a particular speed, to add that time to one of two clocks A or B, and then to toggle between the clocks for each leg of the rally while recording the cumulative error as you go. In the special situation where the Distance = 1.00, the app will change its functionality to the "Split mode" where you can incrementally add or subtract distances of 1.0 or 0.1 miles or kilometers. Many rally teams monitor progress along the rally course this way. By manually incrementing the distance each mile elapsed since the start of a leg, for example, the Ideal Time will increment as well and the Cumulative Error will as well. Whether you choose to compute Time, Speed, or Distance, the unknown factor can be computed from a combination of the other two. Additionally, you may add or subtract time from the Ideal Time using the adjustment options on the pop-up below the Speed input. The time and distance measurements can be set to seconds or decimal minutes (cents) and to miles or kilometers in the app Settings. 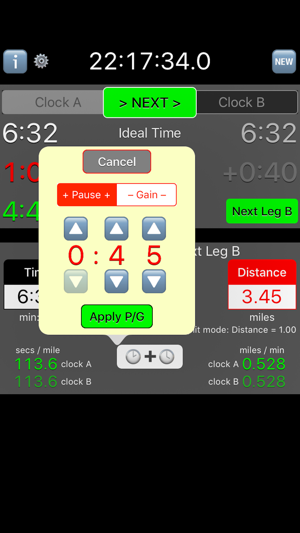 - Added a feature that allow users to input distance in increments of 1.0 or 0.1 miles or kilometers for the purpose of setting the ideal time at a particular split distance. By doing this, you may compute rolling time error vs. ideal time. This helps you stay on pace during the rally. 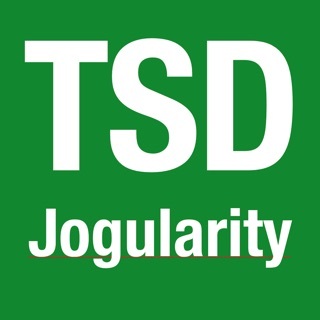 - Numerous code improvements for better performance and efficiency. - GUI changes to accommodate new features, to increase feedback to users, and to enhance visibility in daytime.